Thursday January 4, 1945. The assault started at 08h15 in a bitter cold weather, after a short artillery preparation (some rounds dropped short into a platoon of Cie B / 3rd (550th) Battalion). As planned, 2 companies of the 3rd Battalion on the right (Cie B on left and Cie A on right with Cie C in reserve) and 2 companies of the 2nd Battalion (probably Cie D on left and Cie E on right with Cie F in reserve) on the left pushed off. In the area of the 2nd Battalion, the objective was Hill 460 (north of Rechimont) located approximately 1800 m from the departure line (Pinsamont). German artillery opened fire nearly immediately when the GIs started to go down toward Laval. Arriving at the foot of Hill 460, the men are obliged to cross a little river called Rau de Laval. German artillery continues to harassing the glider men with relatively low intensity. Cecil W Winburn (ASN 6882691) was wounded during the crossing. He will die on January 9 of their wounds. While the men climbed the hill, the German troops of the 2nd Armored Battalion of the Fuhrer Begleit Brigade opened fire. Numerous men of Cie E are left lying on the ground and Cie F is immediately engaged closed to Cie E in attempt to continue the offensive. According to testimony of Staff Sergeant Ronald S Worden from Cie E (1), the german soldiers were very closed to the american soldiers when they opened fire. Technical Sergeant Ervin W Jokinen (ASN 6802012) was killed in action while trying to neutralize german soldiers dug in in a fox hole located closed to him. Staff Sergeant Ronald S Worden (ASN 33436148) destroyed soon after the german position with a MKII hand grenade. It became gradually impossible to progress and men dug in under german fire before 12h00. This map is an attempt to summarize the first actions again the ennemy on January 4, 1945. Not sure it is the exact location of the different units involved (TFH collection). In the area of the 3rd (550th) Battalion Company A had also its first contact with ennemy nearly immediately (reported at 08h25) just before arriving on the main road from Milliomont to Hubermont, approximately 150m east of the crossroad to Rechimont. No tank was in support at 09h50. The 3rd (550th) Battalion continues its progression to reach at 09h55 a position located in a parallel line to the road, 180m more to the north astride a field path. At this time, the right side of the Cie is not far from 100m north of the main crossroad of Milliomont. The German artillery opens fire on Hubermont area at this time. It seems the Battalion has no idea where is the 2nd Battalion at 10h50 and need urgent intervention to repair wire line at 11h30. Despite the fierce work of Marvin E Haines (ASN 19004518 ? ), the battalion command SCR 300 operator, the communication problems remain, especially with the 2nd Battalion and new asking for urgent intervention is repeated at 11h30. It seems Cie A / 3rd (550th) Battalion withdraws on the Milliomont – Hubermont main road at this time and then pushed on more on east to take Renuamont. A wrong information concerning a withdrawing in the 2nd Battalion area came at 12h40. The Battalion Command Post moved in the basement of a farmhouse in Laval. An anti-tank gun was set up in each side of the Command Post. One gun crew open fire in direction of germans but the response was immediate and an 88 mm gun opened fire twice to adjust the target. The third round destroyed the American gun causing several wounded. At 13h10, on the left flank of the attack, the 3rd Battalion is located front and left of Renuamont, approximately astride the road going from the town to the N4 road. Cie A is hold on behind the town. Cie C is committed. Maintaining the pression, men of the Cie A enter into town around 13h55 and north east part of Renuamont is cleared at 14h50. Men of Cie B entered into town at 15h00 but german tanks are seen in the area. The Battalion Command Post again toward a building located in the crossroad of Hubermont then to Milliomont. By night fall, Cie B and Cie C were in the buildings in town but the capture of the little village caused fairly high casualties. The regimental’s reserve battalion occupying Hubermont at 14h15. At 15h34, the 2nd Battalion inform the Regimental CP that he has not withdrawn and maintains ground gained. At 15h30, Colonel Pierce, the Commanding Officer of the 194th GIR decided to move his Command Post in the town of Houmont to be closed from the front line. The new Command Post was opened around 20h30 and immediately harassed by the german artillery making casualties as Private Vincent S Sorrento (ASN 32929753) and three buddies from Cie HQ who were wounded by wood shrapnels while dug in in their fox holes. 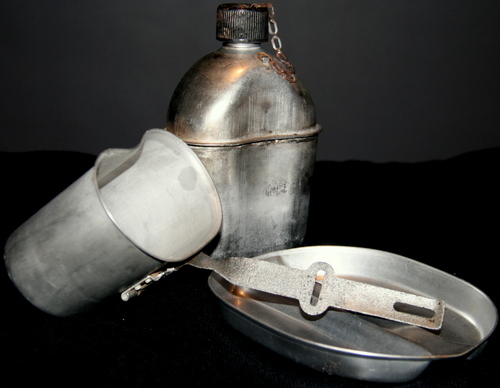 Canteen, cup and mess kit recently dug out from an old fox hole located in the area of Houmont. Note that condition is excellent for dug out items and it is still possible to read the name of the maker and date : US S.M.CO 1944 (TFH collection). Due to the heavy lost, half of 194th medics move also forward Houmont at 15h45. 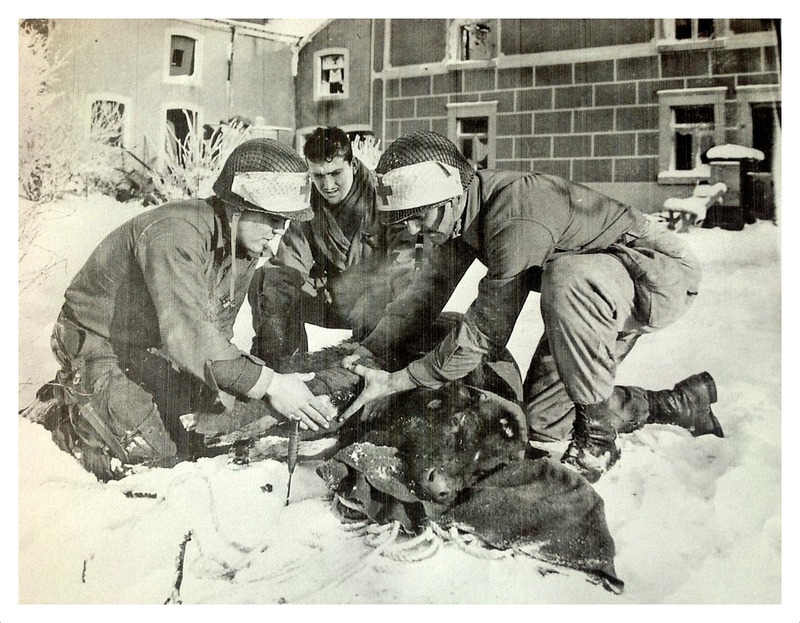 This photo extracted from "TALON with the 17th in Ardennes" shows 17th AB Medics in vicinity of Bastogne giving first aid to a calf. In fact, this photo was realised in the village of Houmont and shows from left to right the Pfc Sterling E. Tucker of Fredrickstown Mo, Pfc Harold R Hilsabeck of Springfield Mo and Pfc John C Smith of Danville Va. All men are medics of the 194th GIR (US National Archive). When the night falls, volunteered in the 2nd Battalion area bring wounded men neglected on the ground in morning back to the lines. They rescued all they could. In the area of the 3rd Battalion, Colonel Edward I Sachs was worried by the fact he has no contact with the 2nd Battalion on left and he wanted to withdraw from the town but was ordered to hold the place. The estimate casualties in the 3rd Battalion was some 80 men killed, missing and wounded. About 23h00, germans launched a counter offensive with infantry and approximately 15 to 20 tanks. 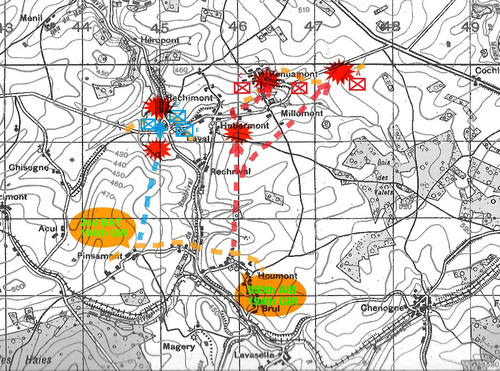 Despite a heavy artillery fire and support of Cie A, Cie B and Cie C were progressively surrounded. ADAMS Roy B (ASN 33598882) - Pvt. 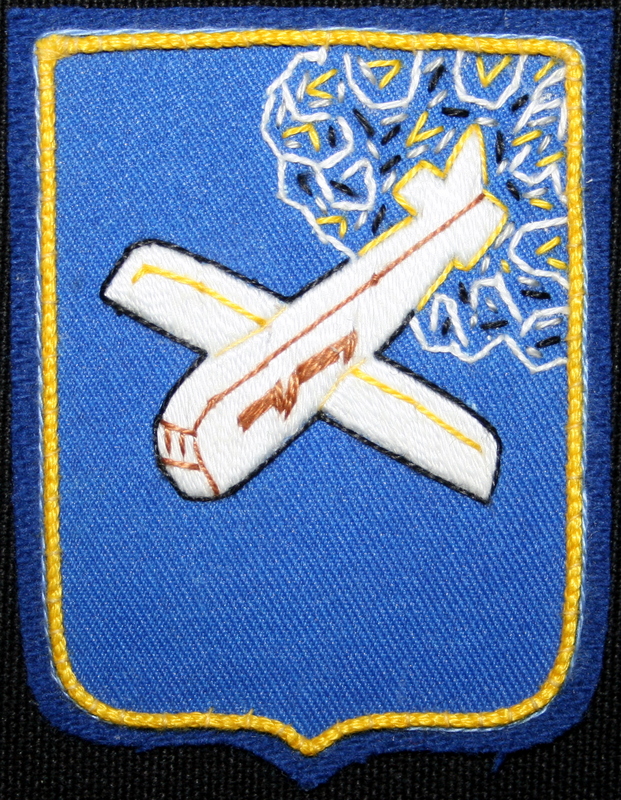 BRANN Robert L (ASN 37610931) - Pfc. DOWNS Fred (ASN 37211559) - Pvt. FAIRCHILD Charles E (ASN 37610689) - Pfc. GAMBLE Edwin D (ASN 42061765) - Pvt. HUMPHREY Robert L (ASN 35055982) - PFC. KYLE Myron H (ASN O- ) - Captain HQ2 Cie.
MEYER Donald A (ASN 37668428) - Pvt. MILLER Belford (ASN 33835897) - Pvt. MILLER James V (ASN 39336516) - Pvt. NOLAN Joseph P (ASN 42053500) - Pvt. ROWLAND James F (ASN 38692911) - Pvt. SCHERMER Robert W (ASN 36960899) - Pvt. STONER Frank D Jr (ASN 33507127) - Pfc. RIGGS Mont L (ASN 37668750) - Pfc. 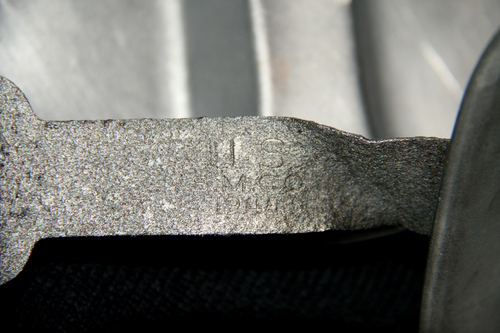 WOHLBACH Lester F (ASN 33621820) - Pfc - Cie C.
(1) in “Tonnerre du ciel - L’histoire de la 17th AB” from Xavier Van Daele, SRE Editions 2012.